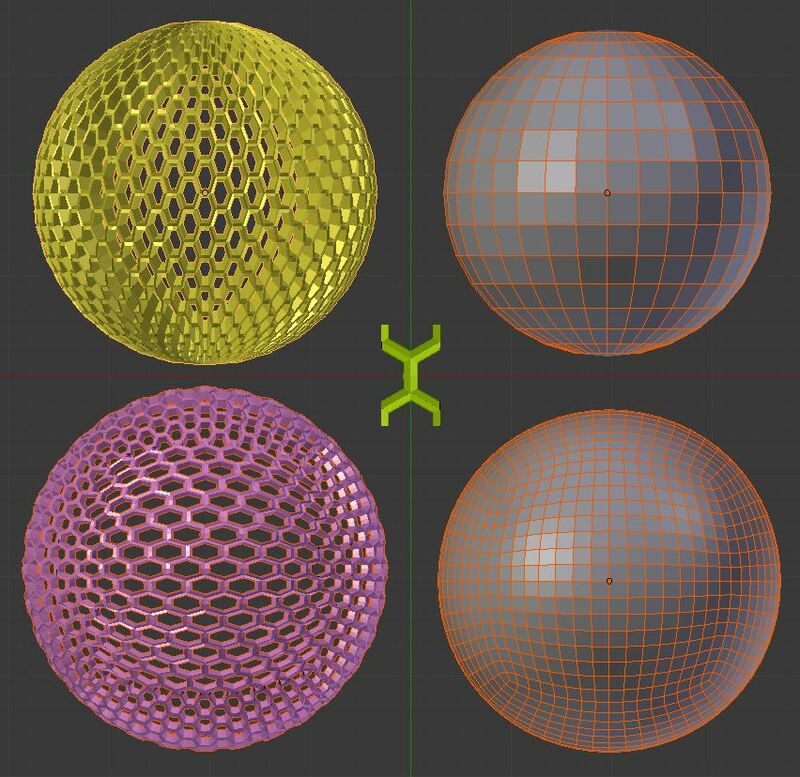 How to turn my honeycomb pattern into the sphere? I'm new to bender and followed some tutorials. After following this one I'm trying to make the pattern I have into a ball. I can make the pattern follow a path, so it's probably not that hard to make it follow a sphere. However I'm stuck and I don't know if it's possible. Hope somebody can help. Thanks in advance. You may achieve it beveling the Ico Sphere (Percent mode) and inseting the faces. Add an Ico Sphere and subdivide it (in my case I've made 3 subdivisions). Select the whole mesh in Edit Mode with A and press Ctrl+B to bevel it. Use the Mouse Scroll to reduce segments to 1. Press M twice to enable the Percent mode and scale hexagons to lay as close to each other as possible. Next remove doubles with W-->Remove Doubles. Increase the Merge Distance value if needed. NOTE: You can achieve similar effect using the Bevel Modifier, but geometry may be more dense then. Now add a Subsurf Modifier with some subdivisions and smooth the object in the Tool Shelf's (T) Edit panel. With the whole mesh selected press I twice to inset individual faces, then scale the faces inwards to create the holes. Finally with the whole mesh selected (A) press Shift+E to crease the edges. Play with the Mean Crease value in the Transform panel of Properties Shelf (N) to adjust its strenght as you like. FINAL NOTE: The model has pentagons as @kheetor warned about, but they're not much noticable. Really like Paul's solution, but just to give another option. With the understanding that a perfect honeycomb sphere is theoretically impossible, and just going for a look here. This option does require the Tissue Add-on. Create a hexagon from a 6 sided circle and give it some thickness. Add a cube and sub-divide it smooth. Choose Quad and adjust scale if you like..
You can always adjust the original mesh and update the generated. Note: Do this is Top view for predictable results. 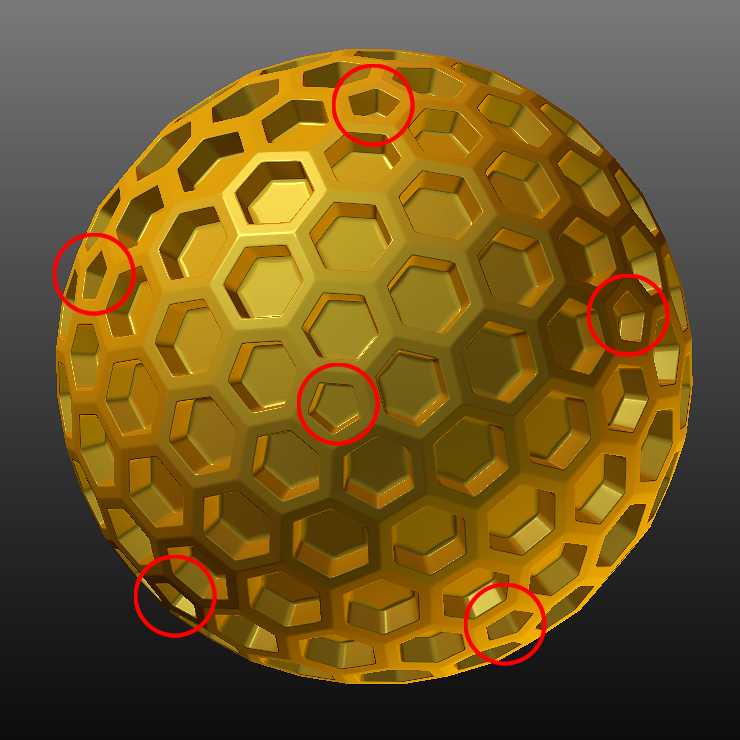 How can I create a hollow sphere with regularly spaced holes? 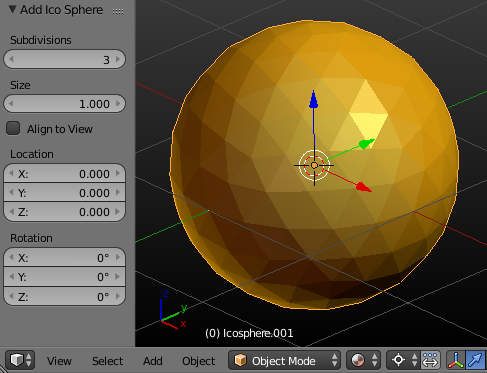 How do I make a sphere with 5 flat sides? How do I fix this issue with weird faces? How to make a mesh follow the curvature of another deformed mesh?